Generators are typically used to provide electricity during power outages (e.g., during storms, emergencies, and related disaster-relief operations) or in off-grid situations or areas where there is no access to a built-in power source (e.g., on construction sites, on camping trips, or at outdoor events—for concert stages, food booths, etc.). So, in a nutshell, they’re mostly used for temporary, portable/mobile, back-up, or remote power needs. Conventional generators have a number of downsides. They require gasoline (or diesel fuel), which can be expensive—especially during emergencies, when there can also be gas shortages. The stinky emissions from gas-powered generators also contribute to air pollution and climate change, and they can cause carbon monoxide poisoning when placed inside a home or building, or too close to doors, windows, or vents on the outside of a building. (In fact, several people who were using generators due to Hurricane Sandy died from carbon monoxide poisoning.) Furthermore, gas generators are very loud. Below is a list of the U.S.-based solar generator brands that I’ve looked into so far; this is not a comprehensive listing. If you know of other brands of solar generators and would recommend them, please let us know in the Comments. Thanks! 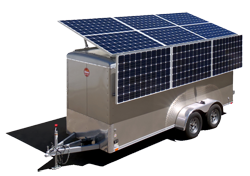 These solar generators are designed to provide a modest amount of electricity for temporary, emergency, or low-use power needs. The smallest units can easily charge gadgets and power lights, but do not have the capacity to run large, power-hungry equipment or appliances (e.g., refrigerators or heaters) for more than a short time. (For example, a 1500-watt unit can generally only run a small space heater for up to 2 hours or so at night, when the unit is not being recharged by the sun.) The average price among these compact options is somewhere around $2,500 – $4,000, though you can find some that are less expensive (note: the cheapest products often use panels or components that are made in China). The prices could change significantly in coming months and years, as the cost of solar panels continues to go down, and battery and photovoltaic technologies are evolving rapidly. Some companies offer hybrid systems that allow for back-up generation using biodiesel, if solar power is not providing enough power for a user’s needs. Please chime in with additional info and recommendations based on your own experience or knowledge of solar or biodiesel generators! Love the points here, looking into making a sort of DIY power setup for myself soon. Can’t wait to delve into this sort of stuff. Hopefully it’ll be something to be proud of when I’m done, wish me luck! Certainly, but we all need to realize that adding Solar to their house is an asset which could increase the long term value of their home if / when they make a choice to sell. With the environment the way it is going we are not able to dismiss any product that provides 100 % free power at no cost to both the buyer and more notably the earth! 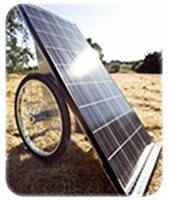 I’ve never seen one of those mobile solar panels before, it looks fantastic! Yep, grid-tied systems will shut off during a power outage. But it is possible to get a battery back-up for a grid-tied system, to help provide a little power during outages. Thanks for the follow up! I wasn’t aware that grid-tied systems don’t work during power outages. I’m definitely not an electrical engineer, but I had envisioned the PV array being connected first to your home & then to the grid. Is this not the case? Indeed, for people who have the ability ($$, ownership status, and adequate south-facing area) to install a permanent PV system for their home or business, that’s a good way to go. But if it’s a grid-tied system (rather than an off-grid system), it won’t work during a power-outage. Also, there are other situations and circumstances where only a portable/mobile generator would fit the bill, e.g., for mobile disaster-relief operations, on temporary construction sites, on camping trips, or at outdoor events—for concert stages, food booths, etc. ; or for people who rent or lease a home or building. It’s also conceivable that some permanent solar arrays could been damaged by especially strong storms, and generators could provide back-up power. Interesting information! I had no idea these things existed. The odd part of it (maybe just from my perspective) is why you wouldn’t just set up PV panels permanently at your home or business. That way you could actually benefit from their power production year round (hopefully) and in an emergency as well (plus they’re already set up! ).